The holidays are here! Can I say Happy Holidays? I’ll take any friendly holiday greeting happily… I love this time of year. We celebrate Hanukkah in our house and there isn’t much decorating or preparing. It kind of sneaks up on me every year, especially when it comes early. In fact, I just figured out over the weekend that the first night is tonight! See what I mean? Truth be told, we just pull out the menorah and that’s about all the festive decorations you’ll find in our house. I know some fellow Hanukkah peeps go to greater (and better) lengths to make it a festive occasion. We don’t seem to put much effort in these days, but it works nicely for us and there’s always my mother’s latkes – the most important part of the holiday. I love having Hanukkah dinner with the family. Personally I only need 3 things for Hanukkah: latkes, applesauce and sour cream. I know this isn’t a very holiday’ish recipe, but if you find yourself running around like a crazy person preparing for the holidays and you need something fast to make for dinner on a weeknight, this is it! 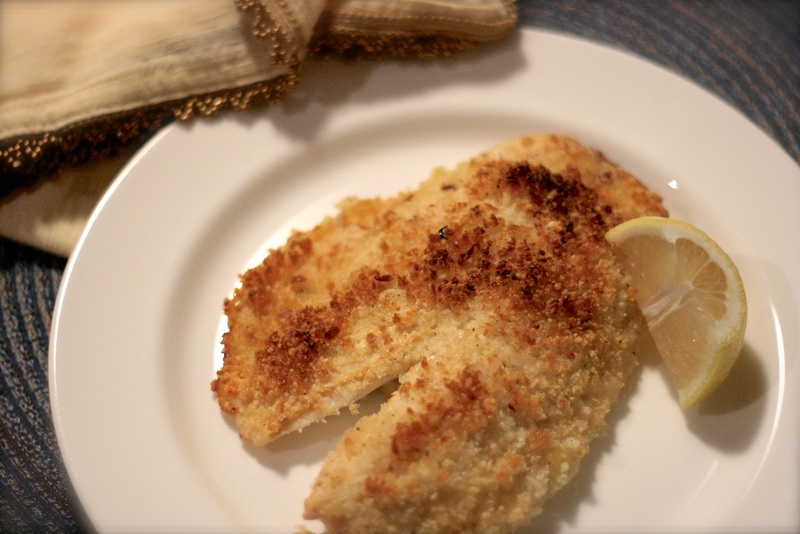 If you’re not a tilapia lover you can definitely make this with another firm white fish. Tilapia is so mild, it works really well here, and it’s generally pretty inexpensive, too. I know there are some folks out there that say cheese and fish are a “no-no.” I disagree. With linguine and clam sauce, I must have Parmesan… zuppa di pesce, I like a little grated cheese and how about cream cheese and smoked salmon? Is cream cheese actually considered a cheese? Anyway, the combination of the panko and grated Pecorino makes an addictive crunchy topping. If your kids eat fish, this might be one they’ll like. 1. Preheat the oven to 400 degrees and line a sheet pan with foil. Brush the foil with a little olive oil. 2. Combine the panko, Pecorino, red pepper flakes and a little salt and pepper in a small bowl, set aside. 3. 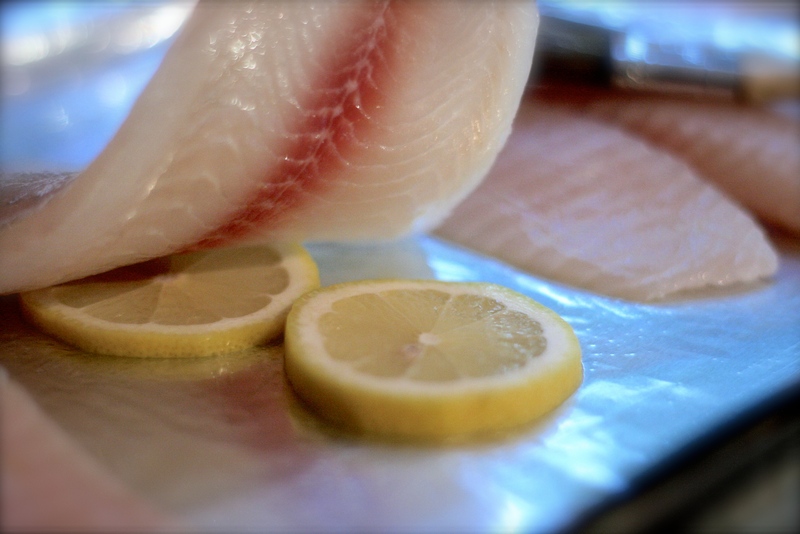 Place the fish fillets on the foil lined pan and lay 2 slices of lemon under each piece. 4. Brush about 2 tsp of Dijon mustard on each fillet. It doesn’t have to be exact, just make sure you get the whole top of the fillet coated, like I’ve done above. 5. 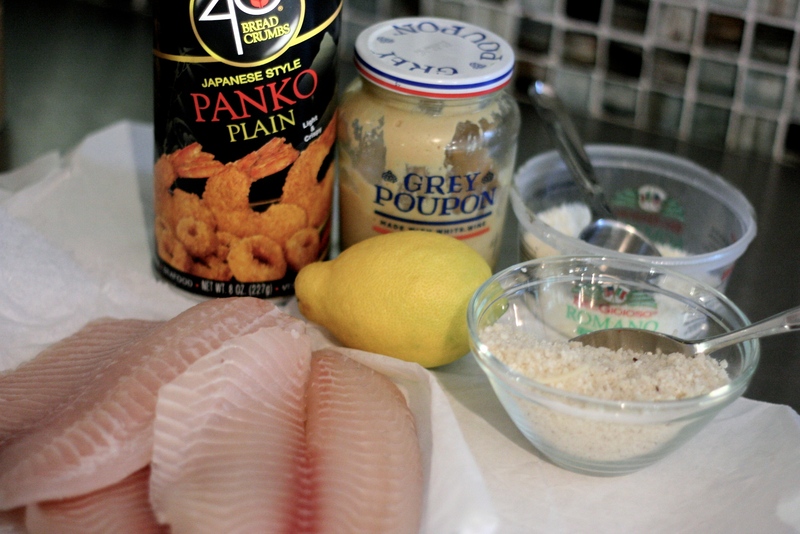 Sprinkle the panko mixture evenly over the fish. You want a nice thick crunchy topping. Then lightly drizzle a little olive oil over the panko crust. 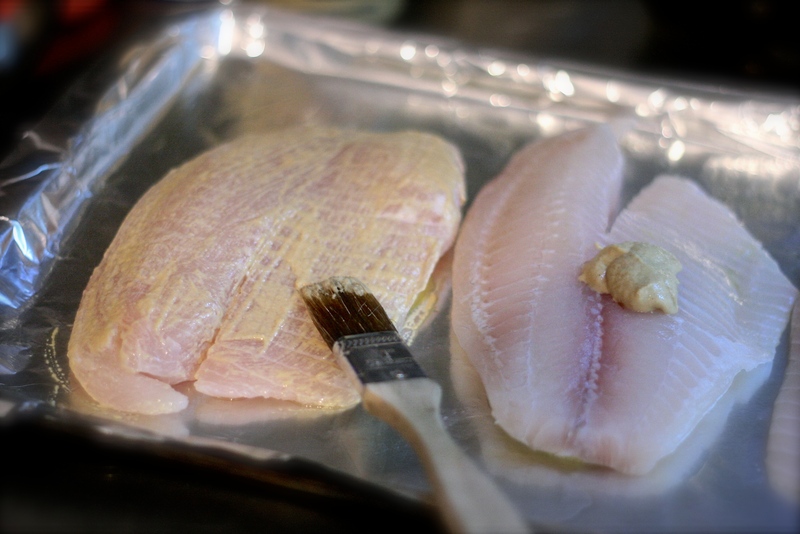 Place pan in your preheated oven and bake for about 12-15 minutes or until the fish is cooked through. Timing will depend on how thick your fish is. 6. 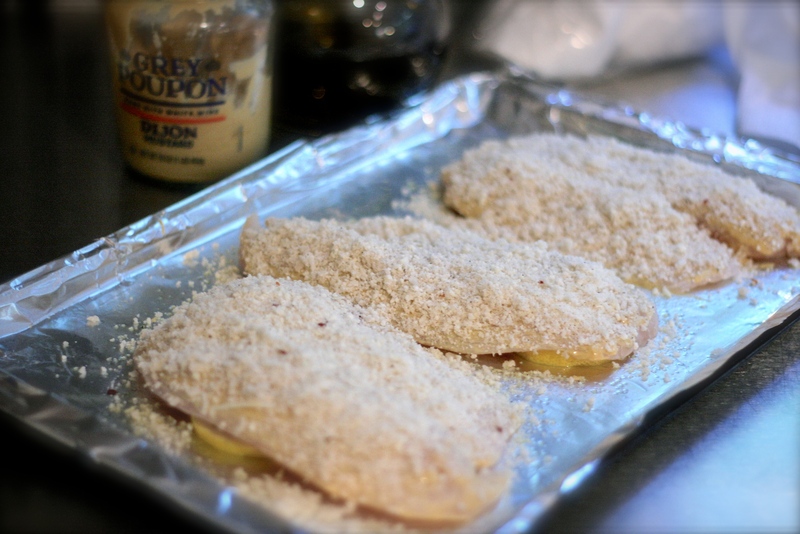 Right when the fish is done, transfer it to the broiler to finish browning the crunchy topping. Keep an eye on it and don’t walk away. It only needs a minute or two. You can rotate the sheet pan to make sure it browns evenly. Serve immediately with a wedge of lemon.